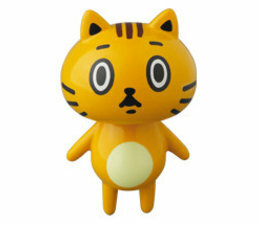 This is the Yellow edition of the Eto Cat figure, part of the VAG (Vinyl Artist Gacha) Box series 1. Designed by Baketan x Medicom toys. Medicom Toys have released their 1st run of blindbox series VAG (Vinyl Artist Gacha) series. Instead of the usual Gachapon packaging (plastic ball) the Box series are packaed in a sealed cardboard box. Series 1 of the popular Vinyl Artist Gacha line features the work of Japanese artists T9G x Shoko Nakazawa, Konatsu and Baketan. Each artist series comes in 5 different colorways and stands approx 2.5 inches tall. The Eto Cat (Yellow) VAG Box series 1 by Baketan x Medicom is a limited edition.